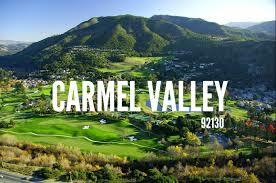 Originally Carmel Valley was named North West City until it took on the Carmel Valley in the 1990’s. It is classed as one of the newer neighborhoods that make up the Northwest San Diego county, California. Carmel Valley is situated right at the intersections of I-5 and I-805. This community makes for a perfect place for taking up residency by all age groups. It is fast growing and is well loved for its demographics of rolling hills and canyons. Meeting the needs for simple buy enjoyable Carmel Valley community living are a selection of shops and malls that provide a most pleasing shopping atmosphere. They have received enjoyed the new addition of a shopping mall. For dining pleasure there are quality restaurants that cater to the palates of all the residents. For anything that is needed or isn’t supplied by shopkeepers in Carmel Valley, the residents have easy access to Del Mar amenities or can take a quick trip into San Diego. Movies or fine dining for a pleasant night out are just a few of the sources of entertainment offered to the residents of Carmel Valley. For ongoing and fun family events those who live here rely on the Carmel Valley Rec Center or the Ocean Air Rec Center. There are many different and exciting clubs that can be joined so there is never any risk of boredom as a resident of Carmel Valley. For those who love to be active there is plenty of hiking and trails to make use of. For those who love a park setting this is enhanced with the wonderful outdoor concerts that are available throughout the beautiful warm summer months.